Guys, it's proper snuggle season here in the UK. Don't get me wrong, I love snuggling all year round - is this TMI? - but now that the weather has dropped, the fluffy throws are out and the festive candles are being lit.. well, what better pairing than a good ol' Netflix session? As always, preferably on a UHD TV Panasonic but that's still unfortunately just a dream. I'm sure I'm not alone in this, but, summer is definitely my season for being sociable. I lap up the sunshine and long hours, however, now it's definitely hibernation time. I'm notorious amongst my friends and family for despising poor weather; the rain makes me truly miserable, so I love spending Autumn / Winter having cosy nights in, dinner party feasts with friends and generally just being all snug indoors in my fluffy dressing gown. This is also the season where I come into my own in terms of TV. I spend months and months not knowing what the hell is being aired on TV or not having a clue about what new trending show there is on Netflix, but now, well.. now is the time to get to grips with the situation. 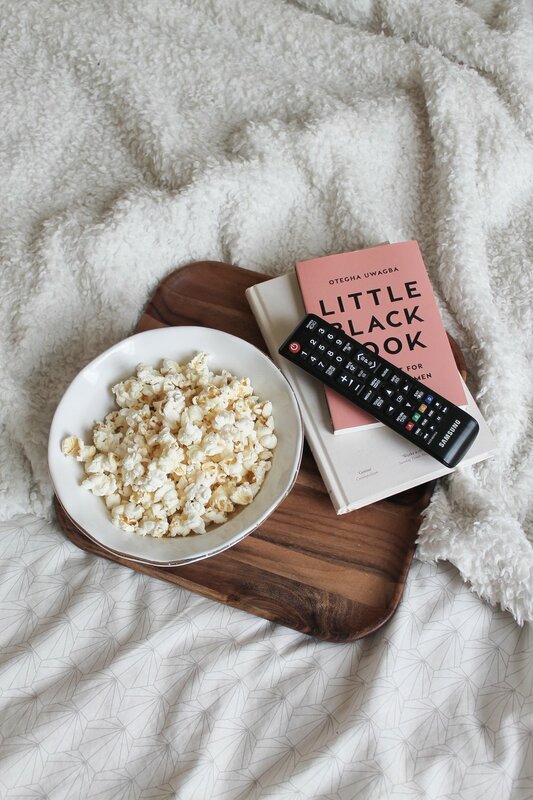 I thought I'd give you all a roundup of my top 4 TV shows that are currently on Netflix so you can not only mock me for my taste (probs) but also have a bit of inspiration for your next Netflix & Chill session. The second season has just finished airing on live TV and I can't tell you how bloody excited I was for it to start up again. That excitement was fuelled by re-watching season one on Netflix (pretty much back-to-back) - as well as half my followers tweeting about it constantly. Season one of Doctor Foster is bloody brilliant, like truly brilliant. It is riddled with jealousy, betrayal, bitterness, greed, obsession, revenge - in short, all the elements that make for really gripping TV. It definitely has elements of Gone Girl and follows the emotional turmoil / roller-coaster of a relationship between Gemma and Simon. Just watch it will ya, you won't regret it. I've genuinely cancelled so many plans so that I could watch Orange is the New Black - sorry friends... but it's definitely the sort of TV show that just screams to be binge watched. We follow main protagonist, Piper's, journey in an all women's prison as she gets caught up in a drug scandal. The show has the perfect balance of drama and comedy and becomes increasingly more engrossing as is spins out from her story; fleshing out the inmates, their backstories, their cultures and their alliances. Despite real comedy value, some incredibly important messages are portrayed and broached throughout each season, ranging from racism to homophobia, which leave many viewers questioning serious cultural issues in society. It ticks so many boxes for me. Ab Fab will forever be one of my absolute guilty pleasures. The show is genuinely outrageous in so many ways and what’s interesting about Absolutely Fabulous is that, 25 years after its inception, the TV series still retains all of its charm and almost all of its comedic relevancy; most (if not all) of the jokes are still very hilarious. Through the TV, I'm able to live vicariously through the lives and mishaps of tragic fashion PR Eddie and her raging alcoholic sidekick Patsy who travel the world downing a cocktail of vodka and drugs, raging, bickering and falling in love with each other repeatedly, as daughter Saffy judges in the corner with her eyebrow raised. It truly is fabulous, sweetie darlin'! Sherlock will most definitely compel you to the edge of your seat and captivate you with this twenty-first century adaptation. I'm a little obsessed with Benedict Cumberbatch, as many women are, so that may have a part to play in my genuine 'can't take my eyes off the screen' watching. However, that aside, Sherlock encapsulates so many aspects of brilliant TV - excellent scripting, dialogue, chemistry and innovative filming and editing. The only downfall would be that Sherlock only airs every two years or so, meaning there's a ludicrously long wait in-between seasons, but it's worth the wait for sure. The other shows I'm keen to watch next: Girlboss, Stranger Things & The Confession Tapes. Are there any TV shows you'd recommend me watching?